We undertake servicing, repairs and thorough examinations on a wide variety of machines, including port equipment, ranging in size from 1 to 50 tonnes. All of the work that we carry out is completed to high standards whilst adhering to all relevant regulatory requirements. Repairs: We can undertake regular servicing or emergency repairs at short notice. Repairs and servicing can be carried out at your premises throughout the UK or Worldwide. Our specialist mobile vans carry everything you might expect in a workshop, including compressed air supplier, 240V generators and a full suit of power tool and lifting gear. Spare parts: We have a wide range of spare parts in stock. We carry a comprehensive range of spare parts for all common folk lifts and port equipment. 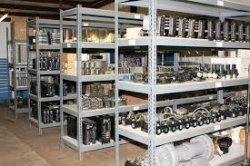 If by chance we don't have the required part in stock we can source parts on a very fast turn-around to ensure that we have everything required available on-site. Welding: DW Forklift Services Ltd boasts a specialist on site welding service which is available to cater for all of your weldings needs. Moving: Our team can help you move your machinery around the country by dismantling, transporting and erecting the equipment at its destination. Hire: If you require a machine to hire, please contact us so that we can help you acquire the best rates available.